A student shares an original song at the 6th annual Open Mic Night. 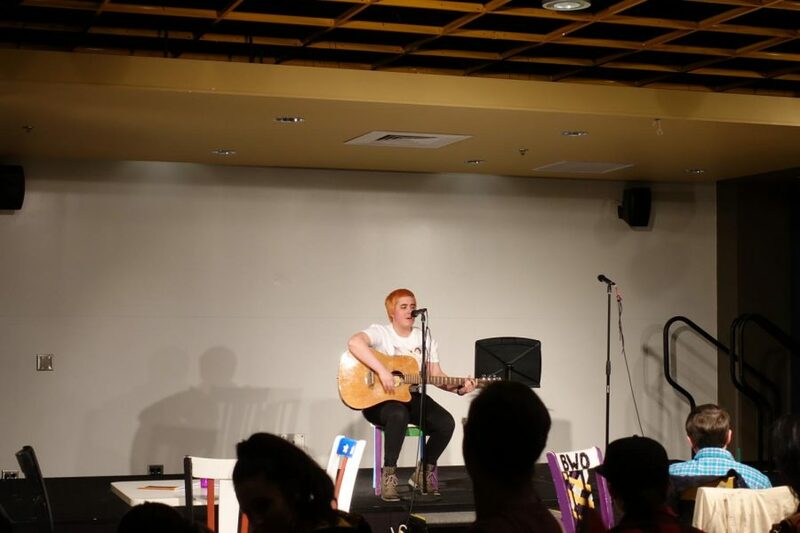 Students, friends and significant others gathered to hear NKU students share their stories at the 6th annual Open Mic Night in the Student Union multipurpose room, as part of the annual Pride Week. Writers including Emma Sanning, who shared her piece “Elephant Toes,” and Meredith Read, who shared what they called “a poem I wrote myself for myself,” were among the students who shared a variety of poems, freestyles, spoken word pieces and songs at the event. Isabel Sleczkowski, leader of the campus queer women’s LGBTQ+ organization Lavender Society, was the emcee for the event and also shared her own poem. 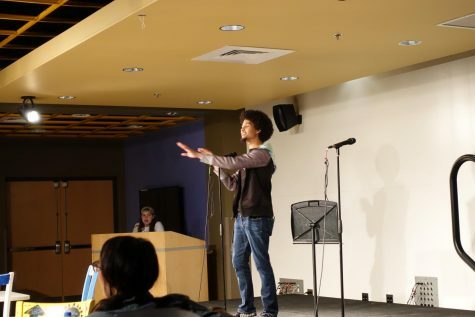 Sophomore computer science student Nathaniel Marcum, who got on stage and gave what he described as going on an “improv tangent,” had the crowd equally confused and laughing. Nathaniel Marcum speaks at the 6th annual Open Mic Night. Marcum said he really enjoyed the musical selections performed at this year’s event, and that this year’s performers were different. LGBTQ Programs and Services, in partnership with campus organizations Lavender Society and Poetic Justice, brought in queer poet Katie Kramer as the event’s special guest. 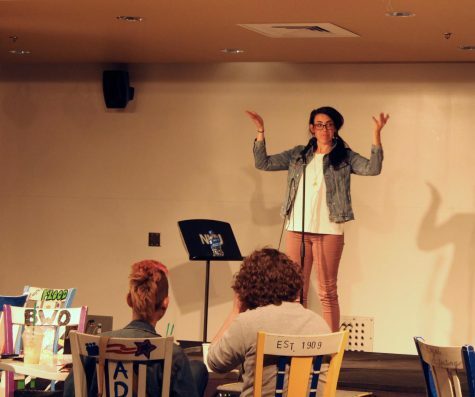 Kramer, who is a nationally famous poet and has toured over 400 college campuses to share her work, delivered a performance that was equal parts hilarious, thought-provoking and emotionally touching. Kramer has performed at NKU twice before, and said NKU’s audiences always bring really great energy. Special guest Katie Kramer dazzled at NKU’s 6th annual Open Mic Night. 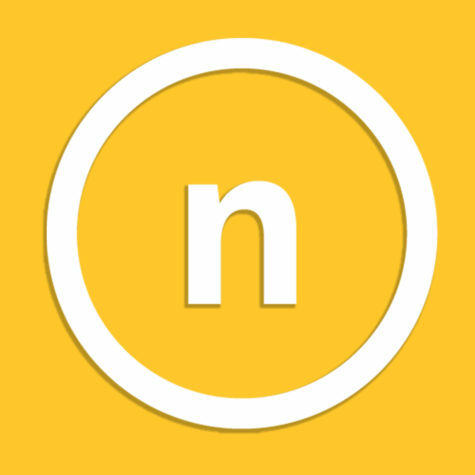 Meyer praised NKU for always supporting the LGBTQ+ community on campus, saying that in her six years as director, she has received an outpouring of support from the administration, regents, faculty, staff and students. She said they see more people coming out every year to events like the Pride March or LGBTQ+ History Month events in October. Meyer said that events like Pride Week are crucial because representation for LGBTQ+ students is important.